In early spring I was co-leading an out-of-state Family Council Retreat along with one of my colleagues, Henry Landes. The first day as I exited through the large doors of the gathering room, I slipped my hand in between the heavy door and wall to catch it from banging the wall. Painfully, I didn’t realize the door would crush my middle and ring finger! The pain was excruciating. I bit my lip hard to keep from crying out and causing a larger disruption than would have happened if I had simply let the door bang the wall. My fingers throbbed as I returned to the group, but I knew I had to find a way to focus. This family deserved my full attention. I found myself wondering how this unexpected painful event would shape my role as facilitator for the remainder of the Retreat. I was pleasantly surprised to discover over the next two days that when I was with the group, the pain receded into the background. During our meetings, I was able to focus on supporting the family to the best of my ability. When I was alone, however, the throbbing became so pronounced and painful that I slept little during the nights. 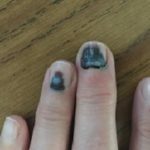 By the third morning I knew that I would need to find a way to release some of the pressure of the totally black nail. The idea of puncturing an area that was already so sensitive terrified me. I put it off. Yup, I avoided it, hoping the pain would diminish. Unfortunately, I was wrong. The pain only grew. At one point, during a wonderful moment with the family, a family member lightly squeezed my hand. I gritted my teeth, once again preferring to suffer in silence. I avoided causing anyone the discomfort of knowing they hurt me. By evening I knew it was time to face my fear. I was determined to “step into the discomfort” (to use my own words about what it takes to “build family muscle”). With the family’s encouragement, I allowed a searing hot knife to touch my throbbing fingernail so the pressure could be released. To my amazement, the relief was almost instantaneous. I was overjoyed! As I reflected on this experience, it occurred to me how my own journey with physical trauma and injury closely paralleled the journey of many of our clients. Indeed, our Retreat focused on a strong, resilient family as they dove into their own emotional trauma and grief. When I tried to keep the door from slamming, I attempted to do something helpful. I didn’t go looking for trauma, nor did I deserve the resulting hurt. It was just what happened. Yet you would have thought I deserved it the way I resolved to suffer in silence. In much the same way, we often do not deserve the trauma and grief we experience. We choose to bear the weight alone – which can make the pain so much worse. This also leads to more injury like misunderstandings and unintended consequences. We suffer because the idea of the knife, of going into the pain, seems terrifying and illogical. Why would we choose to cause ourselves more pain by opening up a wound? Even the pressure that builds under the surface is less scary than embracing immediate pain. Won’t the wound eventually heal, and the pain subside? In my case, it did not. With emotional trauma, grief, or believing certain family narratives, it has been my experience in over 25 years of working with families that it does not. In the event of emotional (and physical) trauma, allowing the knife sometimes is the only way to achieve healing and gain the capacity to move forward. That being said, once we allow the knife – once we break the seal containing our traumas and allow them to flow – the relief can be instantaneous. Yes, the pain is still there to a degree. Yes, there is still plenty of healing in store, but the important thing is that the healing can happen. The pain and anguish is no longer trapped beneath the surface. Sharing the weight of the pain allows us to take that first step. Once the wound is exposed, it is each of our responsibility to find our voice and say “ouch” when our wounds are touched. My finger continues to heal and the family continues to make remarkable progress moving through their traumas. For everyone, the progress has been faster than it might have been if we had simply let things be. The family could have refused to go deep. I could have refused the knife. Together, we moved forward, regardless of the pain. 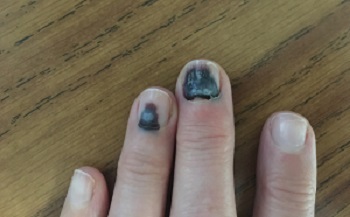 I “let go” of my blackened nail. The family has also let go and are moving through their trauma with courage and vulnerability. I have a new, growing fingernail (the nail came off last week, which is a whole other story!). The family has renewed understandings, a renewed family. I am now grateful for the lesson of my smashed fingers. They reminded me that indeed we can move through pain, undeserved trauma and grief by speaking up. We accomplish so much by allowing others to walk alongside with open hearts and minds – to enter into our pain. Doing so leads to renewed understandings, stronger relationships, and the alignment necessary for another generation of family and business success! 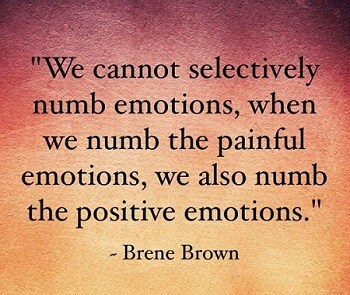 The featured quote from Brené Brown sums up how suppressing pain can lead to stagnation. Growth requires movement. Growth requires being vulnerable. I’d love to hear your thoughts on stepping into discomfort in the pursuit of healing. I invite your comments to sally@dvfbc.com.